Bicéphale features the works of artists Marion Andrieu and Zora Mann and consists of a set of two monographic folded posters bound together into a double-sided publication. Between an artist edition and image-essay, Bicéphale acts as an open comment on the artists’ practices: it brings together an exploration of their universes, inspirations, and references, and highlights internal links in their work through a juxtaposition of images. The back side of the poster presents a special variation on existing artworks by each of the artists. 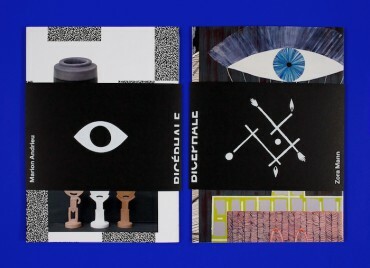 Bicéphale is published on the occasion of the exhibition / interf ∆ ce(s) /, Tales of Babel which was presented at Haus am Lützowplatz, Berlin from April 22 to June 11, 2017.